Can I ever type fast like in the movies? Sometimes I meet people that want to learn touch typing but they actually don’t believe that they can achieve that! That seems to be their biggest problem – the lack of safe confidence. Although they know the whole technical stuff around that, they know how to learn touch typing, but they don’t make progress. We are happy to announce that recently we have added punctuation marks to our typing tutor. This is the result of the users’ requests. Although you can type well without punctuation marks, they are of course the very important part of the language. The algorithm for generating the texts with punctuation marks works the same way as it used to work with only letters available. 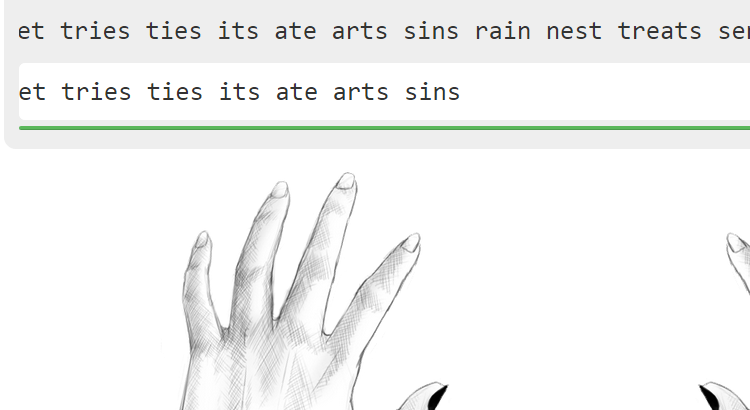 (If you don’t know how TouchTyping.guru application work you can read or listen about that). Some time ago we wrote about how to type faster and now we have recorded the video when we show exactly how to improve your typing skills in the most convinient way. Of course everything with the use of our typing tutor. However, we suppose you already know how to touch type. Without that skill trying to type faster is pointless. It will even be a problem for you, because the faster you type in a wrong way, the harder it becomes to follow the typing lessions then. If you still need to look at the keyboard when typing, or you don’t know which fingers should be used to type the given letter, then be sure to first watch the video on how to start with our typing software. In response to the questions of our users we have recorded the video where we explain how to start learning touch typing on TouchTyping.guru. This is especially useful for the beginners. People who have no idea how to proceed to enjoy the best effects. After watching this movie, if you still need more informations you can read the article where we explain some more features of our touch typing tutor. What to do when you already know how to type without looking at the keyboard and you have mastered all the letters, but your speed isn’t the best? You should definitely further improve your typing speed on TouchTyping.guru. For that you can use our typing speedtest which by default generates words containing the letters that you already wrote erroneously or you had the significant delay before correctly typing them. Make sure to have this option checked in the configuration. The program calculates your typing statistics for each letter and then uses them to generate the text. Test mode to check typing speed is described closer here. Testing the typing speed with TouchTyping.guru means rewriting the text generated online for the selected language. 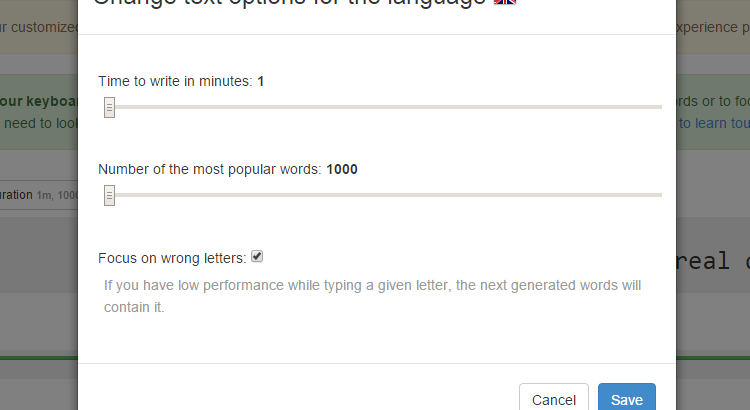 By default, there are always words generated that contain the letters you have written incorrectly, so if you only want to check your typing speed disable this option in the configuration available over the text. If you are logged in the settings will be saved and applied to all the speed tests you will write then. The advantage of TouchTyping.guru – free program for learning touch typing online – is foremost a unique algorithm that supports progress in writing without looking . This eliminates the need to rewrite over and over thoughtlessly “asdf jkl”, etc. – this way it is very difficult to remember the location of the various letters. In addition, there is no need to switch between lessons and decide when to add another letter. 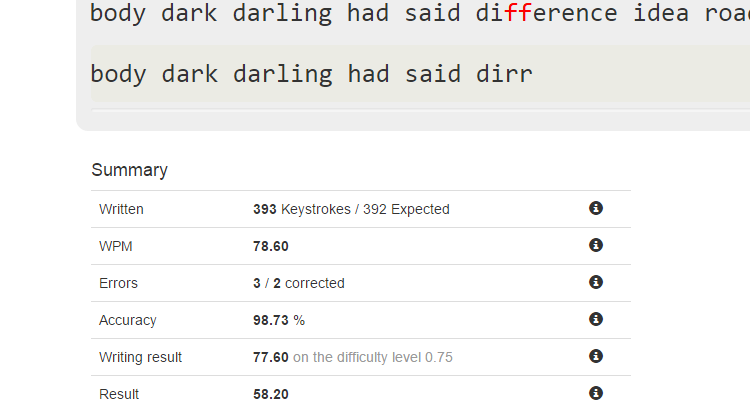 TouchTyping.guru automatically adds another letter based of analysis of your progress, so you can focus just on typing. TouchTyping.guru offers touch typing course for companies, schools and universities. Such touch typing school online is very cheap, convenient and above all effective alternative to other typing courses available on the market. High efficiency is achieved thanks to the algorithm that supports the learning progress and thanks to the competition element introduced to the learning process, which further motivates the students. Do you want to learn touch typing in French? Check your typing speed in Spanish? 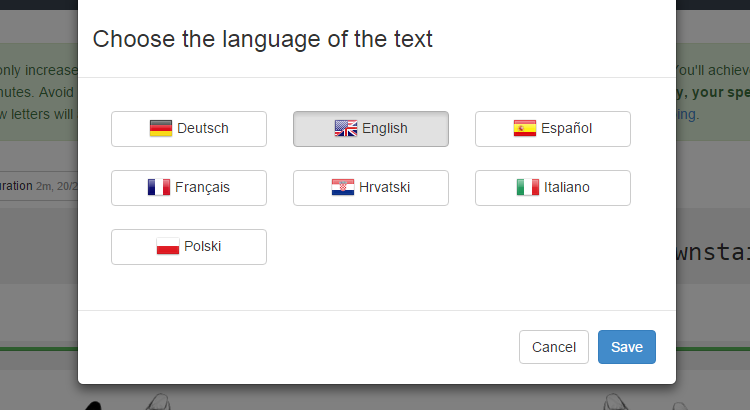 Or maybe you want to take typing speed test in German? No problem – on TouchTyping.guru you can type in multiple languages, and the language you use for typing is independent of the language of the page. 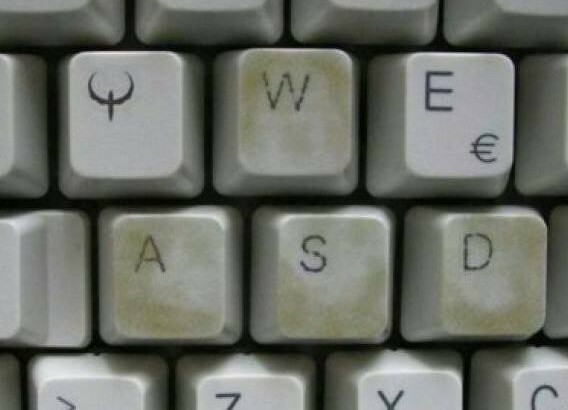 If, for example, you’re going to work in another country, take a look at their keyboard layout before. A lot of characters present in world’s languages are not present on the english keyboard. If you are just starting your adventure with the typing without looking, then you have to start with learn mode. At the beginning you can write one typing speed test to check your current speed which will increase quickly with the training. However, don’t write a lot of tests neither take part in the competitions using hunt and peck method, because this way you’ll only deepen your bad habits. Here, we describe the main features of the learning mode of TouchTyping.guru – free course to learn touch typing online, providing the unique algorithm that supports your progress. 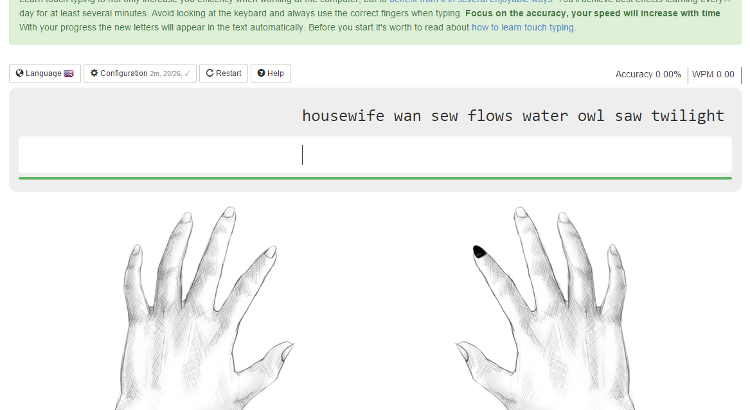 Try out now our intelligent application that will help you to learn touch typing online for free! You need some practice? Test your typing speed or take part in our typing competitions to see how good you are already!